pCloud is a free cloud storage service. It provides you with 10 GB free cloud storage with sharing, no file size limits. You can easily double up your free storage to 20 GB via referrals. pCloud is a pretty robust free service with all the standard features expected from a free cloud storage service, and then some more. You can upload files of any size to your cloud storage, as there are no file size limits. There are no limits on the download/upload speeds either. All of your files are encrypted while being stored in pCloud. Apart from that, you can securely share your files with others via simple unique URLs. You can even provide others with direct upload links in order to have them securely upload files to your cloud storage. Finally, pCloud has native sync apps for almost every platform out there, so you can always have access to your cloud stored content, no matter where you are. Getting excited to ditch Dropbox already? Let’s see how good pCloud is. Before getting started with pCloud, you obviously need to create a free account. Doing so is a pretty standard affair. All you have to do is head over to the homepage, and hit the Register button on the top right corner. Once on the sign up page, provide a valid email address and password, and you’re all set (Although you also need to verify your account via the confirmation email, but that can be done later). Once the account is created, you’re directly logged in to pCloud’s web interface. As illustrated by the above screenshot, pCloud features a pretty standard interface. It’s divided into two vertical sections. The left section consists of the Navigation Pane, which has different shortcuts for quickly accessing various types of files (documents, images, audio, video, archives etc.) saved to your cloud storage. The wider right section is comprised of the Files View, and all of your uploaded files as well as their context specific options (download, copy, share etc.) appear here. A search bar sitting in the middle of the header rounds off the web UI of pCloud. Pretty routine stuff! How To Use This 10 GB Free Cloud Storage With Sharing, No File Size Limits? Step 1: To upload a file, simply click the big Upload button on the left. This will fire up the web uploader. Using this you can select multiple files to be uploaded to your free cloud storage account. You can also upload entire folder if you want. 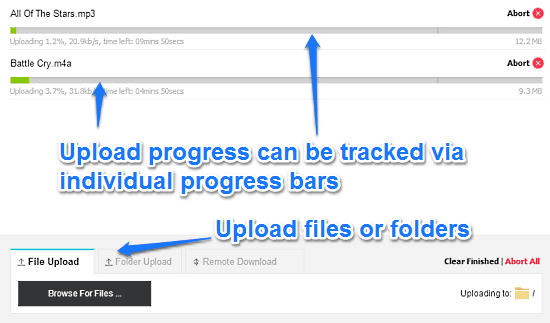 As illustrated above, you can track the upload progress of the files/folders via progress bars, which show the %age upload completion and estimated time remaining. Uploads can be aborted as well. Step 2: Once your files/folders have been uploaded, they automatically appear under relevant categories (audio, video, documents etc.) in pCloud. From the files view, you can directly effect a variety of options on the file. Some of these options are specific to the type of files uploaded to the account (e.g. the audio files have an option to be played online via the embedded player). To view the options available for an uploaded file, simply select it via the checkmark. Once you do that, you’ll see the relevant options on the header bar. How To Share Uploaded Files And Invite Others To Upload Files? 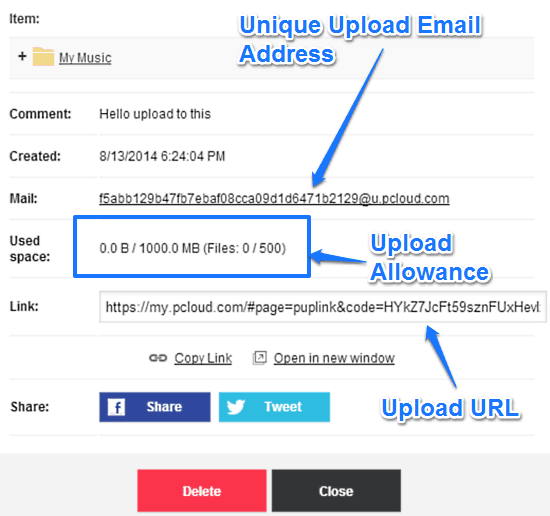 In addition to letting others share/download the files uploaded to your cloud storage account, pCloud also has a unique feature that lets other upload files to your account as guest users. To do this, you have to provide them with a special upload URL. 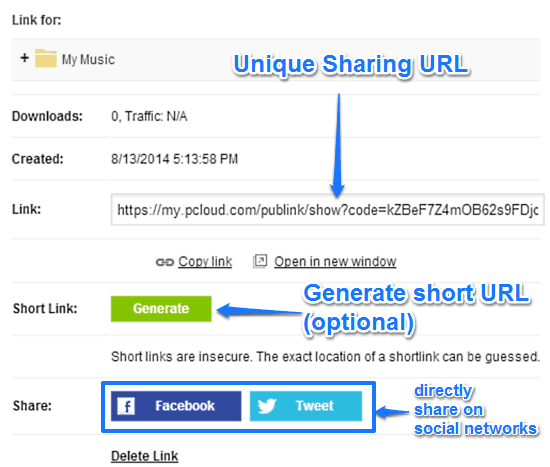 This URL can be then directly used by others to upload files to your account. This link can be generated via the view upload link option against the folder to which you want the users to upload. Other users can upload up to 1 GB of files or a total of 500 files (whichever comes first). One of the most important factors crucial for a cloud’s storage service’s success is the availability of your files at all times, from all locations. Thankfully, pCloud doesn’t disappoint on this front. With native syncing apps available for almost every major desktop and mobile platform out there, pCloud makes sure that you can upload/access your content from anywhere. The native syncing app lets you manage your cloud stored content from the convenience of your desktop. It has an easy to access tabbed interface. You can automatically sync folders, selectively sync multiple files/folder, and more. Apart from that, you can also view general account settings. 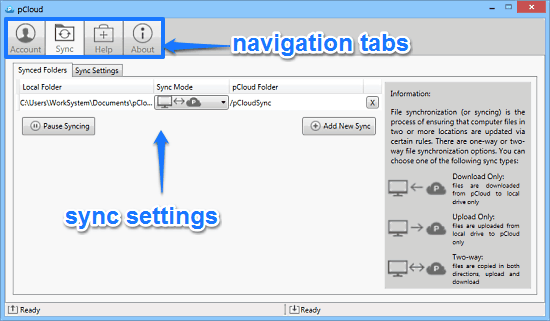 You can download the native sync applications for your platform from pCloud’s downloads page. pCloud is a pretty neat free cloud storage service. It’s simple, easy to use, and has almost all the features that are considered essential for any good cloud storage service. Although the cloud storage market is already oversaturated with established players, and more and more are jumping into the fray everyday, pCloud does have some unique features to set it apart. Most important of them is the ability to let others upload files as guest users to your cloud storage account. Then there are native sync apps for almost every major platform out there as well. Overall, pCloud is a pretty solid cloud storage service that does what it’s supposed to, and does it good. Do give it a try, and let me know your thoughts in the comment below.